Twenty-five years ago I sat in Nancy's cafe in Norfolk and saw an advert for a pelagic trip run by Peter Harrison (now MBE) on board the M.V. Chalice. Although I had been birding a few years my experience of anything connected with the oceans was limited to a small amount of seawatching. The trip changed all that. I still don't do much seawatching from land, but Peter's enthusiasm, and the chance to closely approach birds like Great Shearwater and Wilson's Storm-petrel, had me hooked; and the camera came too! 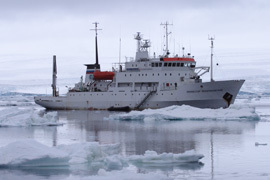 Ann and I have subsequently visited Antarctica, the New Zealand Subantarctic Islands, and the South Pacific, as well as doing the Atlantic Odyssey and the Southwest Pacific Odyssey. (If these terms are unfamiliar to you have a look at Wildwings website on www.wildwings.co.uk). 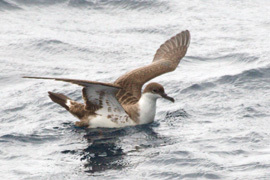 I have also been to the North Pacific (Kuril and Kommander Islands) and done pelagics off California and South Africa. As a result I have built up a sizeable portfolio of seabird photos, especially Albatrosses, Penguins and Petrels. Photographing seabirds is often not easy, in the preface of "Photographic Handbook of the Seabirds of the World" (Enticott & Tipling) it was likened to "photographing a bird on land whilst running on the spot". You can do little to affect the outcome (apart from chumming), you can't set up a hide, or stalk, you just neeed perseverance and the ability to work quickly. A Pterodroma petrel can be past the ship almost before you see it, and Diving-petrels always enter the water just as you've got the focus right! But it's an enjoyable challenge, and some of the times I got it right are illustrated on this site. We would like to thank especially Wildwings and Rodney Russ of Heritage Expeditions (www.heritage-expeditions.com), for providing the platforms from which to attempt this photography, even if they're not always very stable! 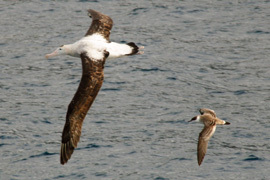 Please follow the links to their sites if you are interested, and also PLEASE visit the site at www.savethealbatross.net, so others may still have the opportunity to do what we've done.